This post contains spoilers for the storyline on Ziost. Read at your own risk! People always complain that the choices in the game don't make enough of a difference, and I do think that this will continue for as long as the game exists, because there are those among the player base for whom nothing but seeing the whole galaxy get destroyed will count as a "meaningful" consequence to your character making some sort of choice, plus the ever-ongoing nature of an MMO puts restrictions on how much you can let a single player change the world that a single-player RPG doesn't suffer from. I was replaying the story on Ziost the other day though (when I originally wrote this post anyway, it's been sitting in my drafts folder for a while), and it occurred to me that I feel that this storyline is actually a good example of how to make choice interesting without things getting too complicated. 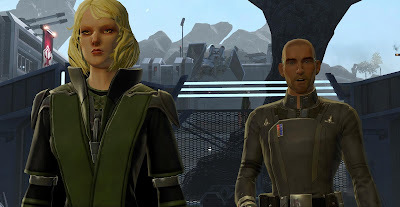 Shortly after landing on Ziost, the player character is introduced to agent Rane Kovach, supposedly in service of Imperial Sith Intelligence and working with Lana Beniko. 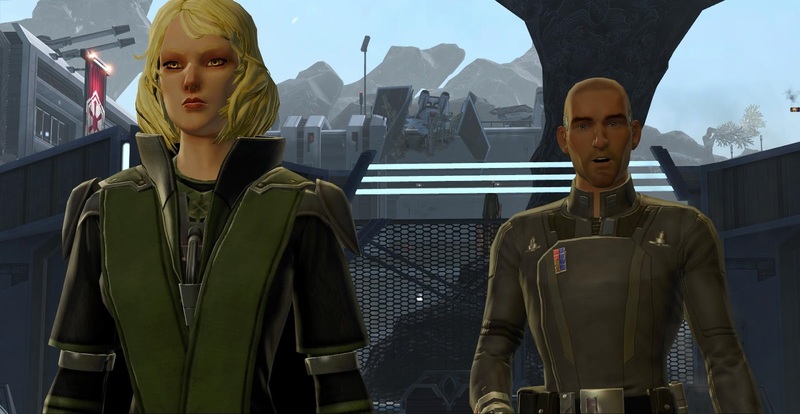 If you are a Republic player, he will quickly reveal to you that he is actually a double agent working for Theron Shan. Regardless of your faction, you later catch him talking to Chancellor Saresh on the holo, which reveals his true allegiance to Imperial players and tells Republic players that Kovach has been going behind Theron's back. You are the one who gets to decide what happens to him after that. On my Commando, I basically told him that it didn't matter (he was still on my side, sorta) and that we had bigger problems to worry about. He couldn't quite believe it and kept expecting me to rat him out. Later he sent me a letter to say that he was extremely grateful for my silence and that he would do his best to keep working on resolving the Vitiate situation. On my Sage, I urged him to confess to Theron. It wasn't pretty, and Theron was understandably pissed off. On my Sorcerer, I made him confess to Lana over the holo. She was furious and asked me to execute the traitor, but I let him get away, out of a mix of pity and respect for his abilities, knowing that leaving him alive would result in one more useful ally against Vitiate. On my Marauder, I cut him down while he was talking to Lana, and then explained to her that he had been a traitor. She then kept beating herself up over the fact that she allowed herself to be tricked like that. Did any of that change Ziost's ultimate fate? No. But it did give every playthrough a slightly different flavour, and it certainly felt meaningful to me to get to decide on whether Kovach got to live or die, carry on with his work or be exposed. It didn't need to have further-reaching consequences for the fight against the Emperor - it was good as it was because it helped to emphasise my characters' different personalities. 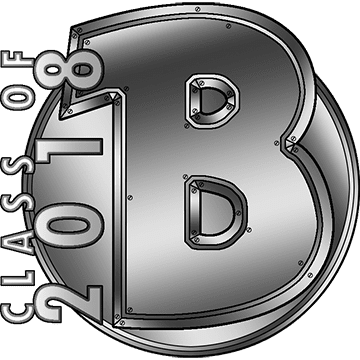 One of these days I'll have to write a more fleshed-out post on what I think makes for good choices in a game like this. Surprisingly, I think it actually has fairly little to do with changing the world. I enjoyed the Kovach parts too. Something nags at me about his past though - I feel we've met him somewhere in the earlier parts of the game, perhaps Balmorra? Something in his dialog made me think back to the Imerial Agent story on Nar Shaddaa (not Balmorra!). The guy supposedly trapped in the imperial prison zone who messes with your implants. He's just the kind of guy who COULD show up later in such a fashion. It has however been many months since I've done either quest series so could well be way off! Ah, you're thinking of Watcher X. They are both bald and have cyborg implants, but that's about where the similarities end. Plus, depending on your choices, Watcher X might be dead.